The programming genius whose 2005 defection to Google set off a legal tussle with Microsoft has emerged as the leading force behind the rapid development of Beijing’s internet sector and also as one of China’s most influential social critics. 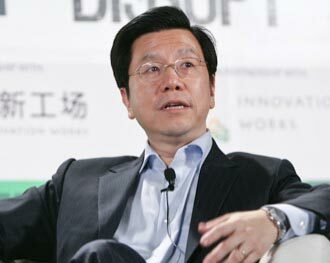 Kai-Fu Lee had led Microsoft’s China research operations and its interactive service division before moving to Google for the unprecedented executive compensation of $10 million in July of 2005, triggering a lawsuit by Microsoft. The suit was settled before the end of the year. Lee left Google in September of 2009, just a few months before the search firm moved its China search operations to Hong Kong to avoid having to turn over user data to government censors. On September 7, 2009, just three days after announcing his departure from Google, Lee announced the formation of Innovation Works, a startup incubator whose goal is to create five successful Chinese start-ups a year in internet and mobile internet businesses or in cloud computing. The firm’s initial $115 million funding came from YouTube co-founder Steve Chen, Taiwanese contract manufacturer Foxconn, Lenovo parent Legend Holdings and WI Harper Group. Since then Innovation Works has launched a number of successful startups, including Google Android projects for Chinese users. In December of 2012 it raised a second venture fund of $275 million. Lee’s major impact on the Beijing tech scene has been far greater than the startups fostered by Innovation Works. Dozens of Chinese executives and engineers who once reported to Lee during his years at Microsoft and Google have leveraged their experiences into Beijing-based startups, including the web giant Tencent, e-commerce innovator LightInTheBox and smartphone maker Xiaomi. On a broader level Lee has become a kind of spiritual guru of the Beijing tech scene, providing both inspiration and guidance to an industry that some see as the closest thing to Silicon Valley in terms of the scale of its innovative tech sector. In 2011 Beijing accounted for 30% of the $13 billion in venture capital investments in China which, in turn, is about half as much as those in the US. The economic slowdown in 2012 saw a big dip in venture investments, but did nothing to disturb Beijing’s secure position as China’s Silicon Valley. One reason is that the city concentrates political clout and wealth like no other in China. Another is its 68 high-quality universities, several boasting China’s leading computer science departments. Those factors have helped the city attract Chinese tech giants like Baidu (which has a $31-bil. market capitalization) and rising smartphone maker Xiaomi which racked up $2 billion in sales in 2012. Lee believes China’s tech sector isn’t yet ready to threaten Silicon Valley’s dominance in the kinds of innovations that can change the world. On the other hand it has the advantage of serving an online population of 560 million, twice the size of the US. That gives it the scale to invest in the kind of fast-paced innovations that may be able to challenge Silicon Valley in the near future. Beyond serving as a mentor for China’s tech entrepreneurs, Lee is also an online social activist whose weibo account has attracted 33.4 million followers. His social commentary on topics ranging from the 13,000 pig carcasses floating down the Yangtze River to the last session of China’s show parliament is spicy enough to attract the constant attention of censors. So many of Lee’s posts have been deleted that he recently posted a graphic on his Twitter account showing the numbers of deletions by week. They rose to a high of 10 per week during two weeks in March, just after a 3-day ban from posting on weibo. Lee, 51, was born in Taiwan and moved to the US in 1973 with his family. After receiving a computer science degree from Columbia, he completed his PhD at Carnegie Mellon University. While there he met a brilliant classmate from China who was still debugging his code on paper while everyone else used a terminal. “That opened my eyes about the backwardness of Chinese computing in general, not to mention innovation,” Lee recalled. But China’s government was already laying plans to break into tech and electronics manufacturing. It began by opening the Zhongguancun technology hub in Beijing in 1980 and followed up with 54 other science parks modeled after Silicon Valley. In 1998 that Lee was able to participate in China’s tech revolution when he was sent by Bill Gates to head up Microsoft’s China research hub. The best way to optimize China’s tech talent under the conditions prevailing at the time, he decided, was to organize them into tightly managed teams, unlike the more free-form structure under which technologists worked in the US. “I had one general leading 10 soldiers, and the soldiers were so grateful and dedicated, they’d work nights and weekends,” he recalls. Lee’s efforts helped seed the rapid expansion of Beijing’s tech sector. Between his first Microsoft days there and the time he joined Google in 2005, the number of hireable computer engineers proliferated from a few dozen to thousands. Equally important was the evolving attitude toward tech entrepreneurship from a precarious situation to be avoided at all cost to one perceived as offering a realistic path to success. In yet another sign that Beijing is maturing into a true technology hub, Innovation Works is now focusing on nurturing entrepreneurs whose experience has been confined to China. Two of the firm’s most promising investments — DianDian, a “light blogging” platform akin to Tumblr, and PaPa, a photo-sharing network — were both started by Xu “Jack” Chaojun who has never studied or worked overseas. Venture capitalist Kai-fu Lee has emerged as the spiritual leader of Beijing's tech scene as well as one of China's most respected social critics online.